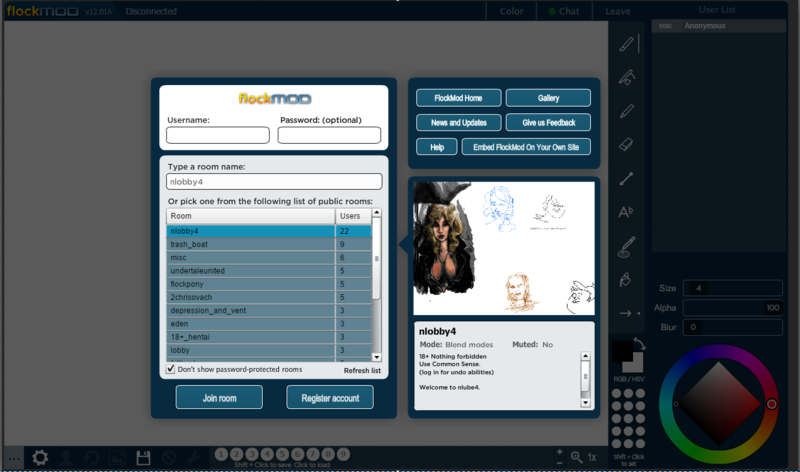 Flockmod is a flash based online interactive drawing board that started off as a modified version of Flockdraw. It has since grown to become its own fully-fledged application which is now hosted on its own servers, no longer depending on Flockdraw to operate. Flockmod is owned and hosted by FDT, being also co-developed by auto, Moon♥ and pen. Is it free to use Flockmod? Yes! All that is asked for from the users is to invite a friend or two, follow the global rules, draw, and have fun! How do I use Flockmod? There are a few ways you could connect to Flockmod. You can connect via the desktop app of Flockmod found here (direct download) (you will need adobe air to run it). This app provides pen pressure support and may result in better performance. You can also use the flash projector (direct download) to connect if you prefer. Regardless of how you connect you will reach this page, it is the main page of Flockmod and it is where you go to connect to rooms. You’ll notice a list of public rooms you can connect to, click on one to read a description about that room. Enable/Disable hardware acceleration, right click on Flockmod > Settings > toggle hardware acceleration. If you’ve downloaded the .swf file, right click on Flockmod > Global Settings > Advanced > Trusted Locations and add the .swf file. How do I register a username and room? 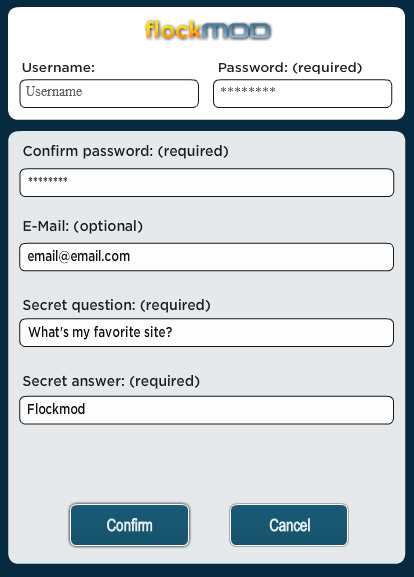 Navigate to the main page of Flockmod, and enter a username and password in their respective boxes. Next click the “Register user” button below the roomlist, and the next prompt will appear. Fill out the following information and hit “Confirm”, and you are finished. You’ll receive a notification informing whether or not the registration was successful, if it isn’t you either need to choose another username or you have created too many usernames, the maximum usernames per person is 5. To register a room, type the name of the room you want and enter it with your registered account. 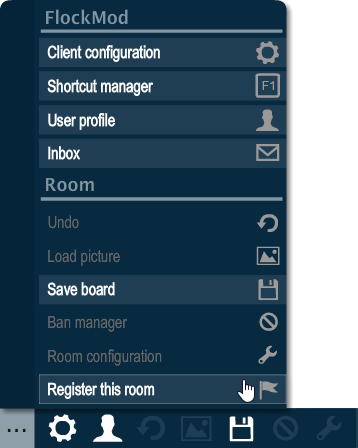 On the bottom bar click the “…” menu to open a list of options, and then click “Register this room”. You now have have successfully created a room and the room management panel will appear. Room management is explained here. If the room registration fails you will be notified of why. You either have too many rooms or the room is already registered by another user. The limit of rooms you may own at one time is 10, however rooms may be unregistered with the User Profile. Why do I need to be registered and do I have to be registered to draw? There are no drawing restrictions for not being registered on Flockmod, but you will miss some features. Being registered on Flockmod allows you to register rooms, have an inbox, and gain a rank in rooms. You will also gain a Flockmod Gallery account to store all your saves. You may also bypass mutes if a room has the option set.